Sirius FM-5 satellite arrives at Baikonur Cosmodrome on May 26th for testing and integration in preparation for 5th Proton launch of 2009. Avanti Communications Group selected as member of North Sea Freight and Intelligent Transport Solutions consortium to deploy satellite communications services for safety and security for shipping in North Sea region. Harris wins $736m 10 year contract to provide satellite ground segment for the National Oceanic and Atmospheric Administration’s geostationary operational environmental satellite. SES Astra joint venture with Abu Dhabi’s Yahsat, Yahlive, to launch first satellite and offer DTH satellite television in fourth quarter 2009. Starling Advanced Communications to introduce StarRail, a broadband solution for trains including an aerodynamically designed satellite antenna, at a trade show next month. Thaicom subsidiary IPStar partners with Comtech EF Data to provide integrated satellite backhaul solutions for mobile and WiMax networks. Manned Lunar landing considered by Chinese scientists, in 2025-2030 time frame. MEASAT signs an agreement to provide MBNS of ASTRO ALL ASIA NETWORKS with 6 Ku-band transponders on MEASAT 3 for 15 years. Microsoft and BskyB to announce partnership to integrate functionality of XBox 360 gaming system and BskyB’s satellite TV service. Spacenet and Orbital Enterprises deploy the Connexstar satellite communications services to support enterprise networks for Star Race Cars. RapidEye reports it has collected more than 69 million square kilometers of at least 80% cloud-free images during its first 100 days. Uganda becomes first country in Comesa regional bloc of Africa to launch a satellite communications system, to promote trade and commerce at reduced costs. SkyTerra excercises option to move SkyTerra 2 satellite launch from Sea Launch to ILS, to be launched in late 2010. ESA’s gravity mission GOCE proves that the sophisticated electric propulsion system is able to keep the satellite completely free of drag as it moves through the outer reaches of Earth’s atmosphere. Soyuz TMA-15 launched from Baikonur May 27 with more visitors for the International Space Station. SES Astra signs agreement with Eurosat and the Country Land and Business Association to extend the reach of its Astra2Connect service in the U.K.
Japanese company NTT Electronics selects Newtec to be its DVB-S2 partner for development of its new integrated receiver decoder, the HVD6100. Satellite Services for HD IPTV. Philippine Long Distance Telephone Co. subsidiary Mabuhay Satellite Corp. withdraws its offer to buy $27.5m worth of ProtoStar preferred shares. European Space Agency awards Avanti €250k grant to design super-fast satellite broadband system called Hercules, to deliver between 2Mb and 50Mb broadband access to 2.5 million UK rural households currently without broadband. ViaSat receives certification from National Security Agency for ruggedized AN?PSC-14(C) Broadband Global Area Network integrated manpack terminal. Thailand’s Information and Communications Technology Ministry discusses with National Telecommunications Commission the possible liberalization of Thailand’s satellite market, given the approaching end of life for Thaicom 1 and 2 satellites. Russia makes plans to detach and fly away its parts of the International Space Station when the time comes to de-orbit the rest of the ISS, likely around 2020. Shelby County Tennessee enhances interoperable contingency communications for emergency operations, deploying SkyTerra push-to-talk satellite services. Builder of Russia’s Soyuz rockets finishes the first rockets due to be launched from South America pad in cooperation with the European Space Agency. Earth Space Agency launches a neutral space marketplace to assist civilian space companies to trade parts, services, and patents required for building space ships, satellites, and space probes. California residents file class action lawsuit against Hughesnet, alleging the company advertised connectivity speeds between 1 and 3 Mbps, while delivering much slower speeds. South Africa’s SumbandilaSat to be launched as secondary payload on Russian Soyuz in August, because primary payload Russian Meteor M weather satellite will not be ready until then. Arianespace launches Russian governmental satellite on Soyuz rocket. Play it again, Romain. Our favorite satcom CEO, Romain Bausch of SES, is making the rounds this month (click for webcast). Talking to bankers and analysts about his company’s strong financial performance currently and beyond. He’s just trying to move the stock price. Yeah, good luck with that The Really Rocket Science Stock Index seems to be doing OK.
Satellite fleet operator SES is rethinking its strategy with respect to its biggest rival, Intelsat, in light of Intelsat’s recently demonstrated ability to maintain a global presence despite its huge debt load and its owners’ ultimate goal of cashing out of the business, SES officials said May 19. In presentations to investors in London, SES officials reiterated their view that, over time, SES’s stable investor base and moderate debt load will enable it to outlast Intelsat in regions that, while profitable, would exhaust Intelsat’s capital expenditure limits. In these cases, they said, SES will be ready to use its financial strength to establish satellite beachheads in markets currently dominated by Intelsat. SES Chief Executive Romain Bausch went so far as to say the eventual disposition of Intelsat assets as its current private-equity owners seek an exit will be more important than the current global economic crisis in shaping the commercial satellite telecommunications landscape in the coming years. "It is not the crisis that will determine what will go on in our industry in terms of concentration," Bausch said of a possible reshuffling of satellites assets worldwide. "The main driver of concentration in our industry will [be] the need of the current owners of the large satellite operators. To be very clear: Intelsat is today capital constrained because of its LBOs [leveraged buyouts, which loaded the company with debt]. There is only one objective of the current owners of Intelsat: to prepare a profitable exit from that business. They are private-equity funds and their mission is not to remain shareholders of a satellite operator for 10 years. "So there might be consolidation in our sector because of the shareholders of one of the two large satellite operators — namely Intelsat — having to exit. This is much more important for the discussion about landscape and concentration than the current crisis." Notwithstanding this strategic assessment, Bausch said Luxembourg-based SES is rethinking its short-term assumptions following a couple of deals Intelsat put together. Intelsat’s New Dawn satellite, being built with South African partners, will require little capital outlay by Intelsat. The IS-22 satellite to be deployed over the Indian Ocean, meanwhile, is being financed largely by the Australian Defence Force in exchange for a UHF-band payload that Australian forces will use for mobile communications. Bausch said that in 2008, SES compiled an internal assessment forecasting that its in-orbit capacity would grow by 4 percent annually. The same forecast concluded that Eutelsat of Paris would increase its in-orbit transponder capacity by 2.5-3 percent annually, while Intelsat would reduce its in-orbit fleet by some 2.5 percent a year. SES now concludes that with the "very creative financing" Intelsat has demonstrated, "they may not go for such an important decrease in the capacity they will offer. So we will probably have to revisit our model and to be less aggressive regarding Intelsat shrinking its satellite capacity. But still, they will not increase capacity." SES is in the middle of a substantial fleet-expansion program that will add more than 20 percent to its current in-orbit transponder capacity in the coming years from satellites already under construction. Robert Bednarek, president of SES Americom New Skies, one of two SES divisions — SES Astra is the other — that divide up the world from a satellite-market perspective, said SES is "not sure we can discern a strategy [at Intelsat] yet. It obviously relates to the long-term plans of the current private-equity holders." Bednarek said Intelsat is likely to conclude more deals similar to New Dawn, where a money-making satellite nearing retirement is replaced through a partnership that permits Intelsat to avoid digging deeply into its own pockets. New Dawn and IS-22, Bednarek said, are "essentially someone else financing a replacement. … I would expect that process — an our-slots-your-money approach of financing either replacement satellites or fresh satellites — to continue. We certainly haven’t anticipated them disappearing from the market, by any stretch." BC Partners Holdings Ltd., Intelsat’s lead investor, has said it is willing to stick with the investment over the long term. Intelsat Chief Executive David McGlade in recent months has said the company’s owners have been willing to permit selected investments in growth opportunities despite Intelsat’s large debt. SES and Intelsat of Bermuda and Washington are by far the world’s largest commercial satellite fleet operators, with market shares in 2008 of 25.1 percent and 24.7 percent, respectively, according to SES estimates. SES assumes that the global market for Ku-band satellite capacity will grow by 4.5 percent per year between now and 2016, while the C-band market will grow by 2.4 percent annually. Trashing your competitor is not going to win you business. Good service and reasonable pricing will. We’ve been ready for the digital transition, with a DB4 antenna locked on to local broadcasts. Haven’t gotten my new coupons yet (the old ones expired, which was stupid). On trash days, there seem to be lots of old TVs at the curb. Then, on cardboard recycling days, plenty of boxes from big LCD and Plasma TVs. Kind of makes sense to me. 1. Recycle- Televisions can contain lead, mercury, cadmium and other dangerous materials and if disposed of improperly these materials will leak into the soil. This may seem like an obvious option but many people don’t even know that television recycling exists. Even if you decide to keep the TV and just remove its guts look for a proper way to recycle the insides. Most major retailers and manufactures are working to increase television recycling awareness. Go to Earth 911 or Plug-in to eCycling for recycling locations and more information. 2. Donate- Schools especially could use the extra TV love. Most schools have televisions in class rooms on closed circuits or use them to show movies and National Geographic specials. Old TVs will still work with DVD players and VCRs. 3. Give it to the Kids- How many times can you stand to watch Disney DVDs? Put the old set in the kids’ room and let them watch their favorite DVDs and you can have a few moments of peace and quiet. 4. 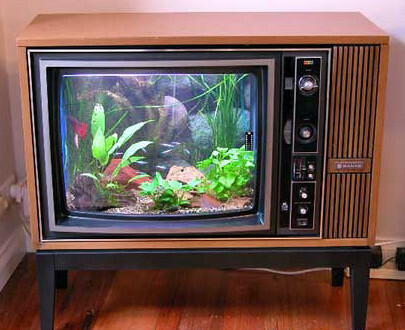 Make an Aquarium- You know you’ve always wanted to make your television into a fish tank. Now is your chance. 5. Use it as an End Table- Those with really old sets that have large wooden enclosures know exactly what this means. 6. Make Art- If people made toilets into art, who’s to say that an old television set can’t be made into art? Use your imagination people. 7. Build a Coffee Table- Turn your television on its back, stabilize, place a piece of glass over top and voila´ you have a coffee table. Hey, you could even hook up a DVD player and have movies play or picture slide shows. 8. Build a Tesla Coil- Take extreme caution if attempting this task. As a matter of fact, forget we ever suggested building a Tesla Coil. They are dangerous and this should only be attempted by professionals. 9. Build a Video Game Machine- For those that like to combine construction and technology you can build an old arcade type console and hook up an old Nintendo or Sega. Pac-Man rules! 10. Make a Planter- Yeah, that’s right, carefully gut the television and make a fun flower planter. Orbit Technology Group announces order worth more than $4m from the French Navy for Ku-band and C-band marine satellite communication systems. Comtech EF Data introduces point-to-multipoint modem, CDM-740, for satellite IP delivery using integrated DVB-S/S2 receiver and turbo product-coding SCPC modulator. Air Force rebuts General Accounting Office report critical of its management of the GPS program, saying it has plenty of ways to keep up the navigation system. NASA’s return to the moon to get support from two satellites, the Lunar Reconnaissance Orbiter, and the Lunar Crater Observation and Sensing Satellite, to be launched together June 17 by an Atlas V rocket from Cape Canaveral. Boeing files accusations against NASA of ‘inexplicably" altering evaluation process between the company and its competitor Lockheed Martin in the battle for a $1.1 billion contract for up to four GOES-R weather satellites. Swedish Space receives all necessary approvals from U.S. government for acquisition of U.S.-based Universal Space Network, a leader in satellite telemetry, tracking, and control services. Seven astronauts expected to return to Earth Friday May 22 after successful 11-day mission to upgrade Hubble telescope. Hubble considered better than new after the mission; never to be seen by humans again – a robotic spacecraft is to steer it back towards the atmosphere and a "watery grave" after 2020. Iridium launches third annual "test your satellite phone" week, encouraging emergency workers and first responders to ensure their satellite phone works, to be prepared in case of a disaster. Congressional investigators conclude that poor planning and unproven technologies on key Pentagon space programs led to cost overruns, delays, and possible gaps in military satellite programs. RRsat expands access of its content management and global distribution services to Africa via Telstar 11N. Finally – NASA’s PharmaSat nanosatellite and the Air Force Research Laboratory’s TacSat-3 satellite successfully launched from Wallops Island. NASA’s largest ever parachute, 2,000 pounds and 150 feet in diameter, will allow recovery of the first stage rocket motor of the Ares 1, of the Constellation Program. Inmarsat selects Arianspace to launch new Alphasat-1-XL satellite using new European platform, Alphabus, and weighing more than six tons, in 2012. ISS Reshetnev wins contract to build Russian Express satellites. DirectTV continues to top customer satisfaction poll among cable and satellite TV operators, as Comcast has greatest improvement, Cox improves, and Dish Network falls. Gateway Communications, the leading provider of African telecommunications services, announces AfricaConnect for South African retail community, following successful implementation in banking, mining, logisitcs, and other sectors. Eutelsat W2A satellite C and Ku-band go live, transferring service from W1 satellite and immediately initiating service for newly won contracts. Russian Proton-M rocket launches U.S. company ProtoStar’s ProtoStar-2 telecommunications satellite. TerreStar and Space Systems Loral announce arrival of TerreStar-1 in Kourou, French Guiana, teeing up for June 24 launch on Ariane 5. ICO Global Communications files legal challenges against European Commision over exclusive licenses inssued to Inmarsat and Solaris Mobile for S-band MSS services in Europe. Avail Media and TVN merge, with investment from the National Rural Telecommunications Cooperative, offering a possible answer to the absence of IP Prime, which SES Americom has announced it is closing down. Airlines race to install Wi-Fi – but how do you squeeze yourself and your laptop into a comfortable work position? ATSB re-schedules launch of its remote sensing satellite, RazakSat, for mid-July. Brazil and the U.S. working to arrest people in Brazil illegally using U.S. Navy FLTSATCOM communications satellites for communications throughout Brazil. NSR report – using stimulus funds to level the playing field, not tilt it – while less than 1% of stimulus package is directed towards broadband initiatives, much attention has been garnered, and present thinking seems to follow a competitive approach that would favor a single technology winner, which would be counterproductive. GAO on GPS to USAF: WTF? It is uncertain whether the Air Force will be able to acquire new satellites in time to maintain current GPS service without interruption. If not, some military operations and some civilian users could be adversely affected. (1) In recent years, the Air Force has struggled to successfully build GPS satellites within cost and schedule goals; it encountered significant technical problems that still threaten its delivery schedule; and it struggled with a different contractor. As a result, the current IIF satellite program has overrun its original cost estimate by about $870 million and the launch of its first satellite has been delayed to November 2009–almost 3 years late. (2) Further, while the Air Force is structuring the new GPS IIIA program to prevent mistakes made on the IIF program, the Air Force is aiming to deploy the next generation of GPS satellites 3 years faster than the IIF satellites. GAO’s analysis found that this schedule is optimistic, given the program’s late start, past trends in space acquisitions, and challenges facing the new contractor. Of particular concern is leadership for GPS acquisition, as GAO and other studies have found the lack of a single point of authority for space programs and frequent turnover in program managers have hampered requirements setting, funding stability, and resource allocation. 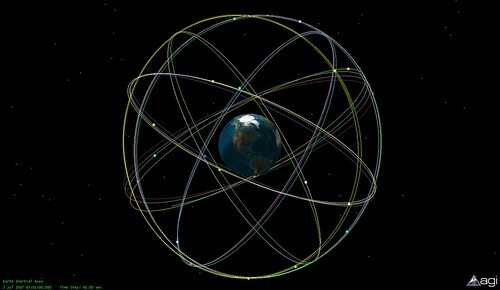 (3) If the Air Force does not meet its schedule goals for development of GPS IIIA satellites, there will be an increased likelihood that in 2010, as old satellites begin to fail, the overall GPS constellation will fall below the number of satellites required to provide the level of GPS service that the U.S. government commits to. Such a gap in capability could have wide-ranging impacts on all GPS users, though there are measures the Air Force and others can take to plan for and minimize these impacts. In addition to risks facing the acquisition of new GPS satellites, the Air Force has not been fully successful in synchronizing the acquisition and development of the next generation of GPS satellites with the ground control and user equipment, thereby delaying the ability of military users to fully utilize new GPS satellite capabilities. Diffuse leadership has been a contributing factor, given that there is no single authority responsible for synchronizing all procurements and fielding related to GPS, and funding has been diverted from ground programs to pay for problems in the space segment. DOD and others involved in ensuring GPS can serve communities beyond the military have taken prudent steps to manage requirements and coordinate among the many organizations involved with GPS. However, GAO identified challenges to ensuring civilian requirements and ensuring GPS compatibility with other new, potentially competing global space-based positioning, navigation, and timing systems. Cost overruns and a diminishing number of spacecraft engineers are likely the root causes. Most folks call it a "satellite dish." 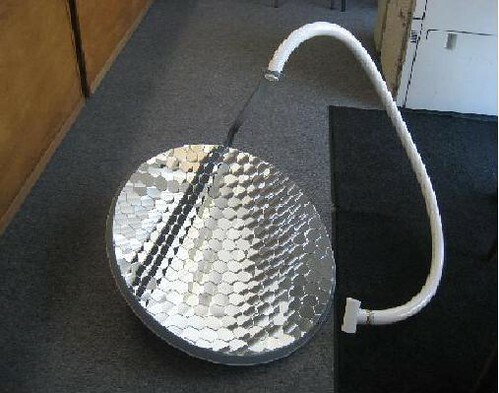 Engineers call it an antenna, consisting of a mount, feedhorn and reflector. The reflector concentrates radio frequency signals from an orbiting spacecraft to give you TV or a two-way data connection. We’ve blogged about people using old "dishes" as solar reflectors, mostly for fun or cooking out in the field. Want your satellite TV dish to pull a double-duty? You can turn it into a solar-thermal device to heat water and cool your home. That’s the pitch from Transoptic, which would place a layer of little hexagonal mirrors resembling a honeycomb or a chrome-coated plastic reflector onto the dish, said Behzad Imani, CEO of the San Mateo, Calif., company. The entire system comes with an optical receiver, PVC tube and an evacuated tube (see a YouTube video that shows how you can build one yourself). The company wouldn’t retrofit an existing dish but instead provide a new one that can receive TV signals and concentrate the sunlight and direct it to an optical collector for heating the water, Imani said. A 2-square-meter dish could generate roughly 82 Therms of energy per year, the company said. A standard water heater requires about 58 Therms per year. Each dish would cost about $300, and installation would cost roughly $300 to $400, Imani said. Transoptic doesn’t want to be in the business of selling the system directly to consumers and installing them. Instead, it wants to sell to home developers, roofers and distributors. Imani said he has lined up a track home builder as a customer but declined to disclose the name. To fulfill the order, however, it would need to raise $250,000 initially to get started on manufacturing, he said. Imani said he would be looking for a larger amount if the credit crunch hasn’t made fund-raising so difficult. The idea is to begin a small-scale production and then use the revenues to expand manufacturing. When it comes to harnessing the power of the sum, solar water and pool heaters far outnumbers solar panels in the United States. Solar heaters are cheaper and you also could get rebates and claim tax incentives for installing them. Great idea. Hope they get financing soon. Just as a spacecraft has many functions, a spacesuit does more than just provide protection and oxygen. A battery supplies electrical power. A two-way radio lets spacewalkers communicate with the rest of the crew. Gauges and controls allow astronauts to be sure their suits are working correctly. Spacesuits have changed a lot in NASA’s 50-year history. The first suits were metallic-silver pressure suits, similar to the ones that Navy pilots wore when flying at high altitudes. Spacesuits have been changed over the years to be more comfortable for astronauts and to meet new challenges as the missions in space changed. 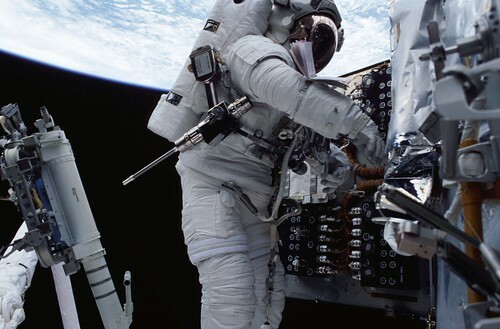 The current U.S. spacesuit worn during spacewalks is called the extravehicular mobility unit, or EMU. "Extravehicular" means outside of the vehicle or spacecraft. 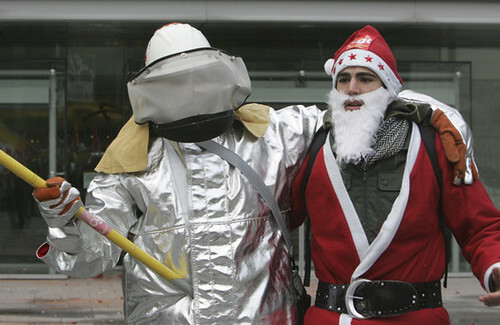 "Mobility" means that the astronaut can move around in the suit.